24/9/2018 – Added in a section about the use of the screen in the physical accessibility section. Grade changes to B- as a result. As a Kennerspiel des Jahres winner, Isle of Skye is a title that has an unusual degree of importance attached to its accessibility. The Spiel des Jahres winners end up in supermarkets where anyone can pick them up, and the implicit endorsement there is that anyone should pick them up. They’re accessible in terms of the ease with which people can buy and play. Are they accessible in the ways that matter to us? We’re going to find out, because that’s what we do here. Just in case you didn’t notice. We gave Isle of Skye four stars in our review so we’re hoping it’s a title that you can easily make part of your gaming library. 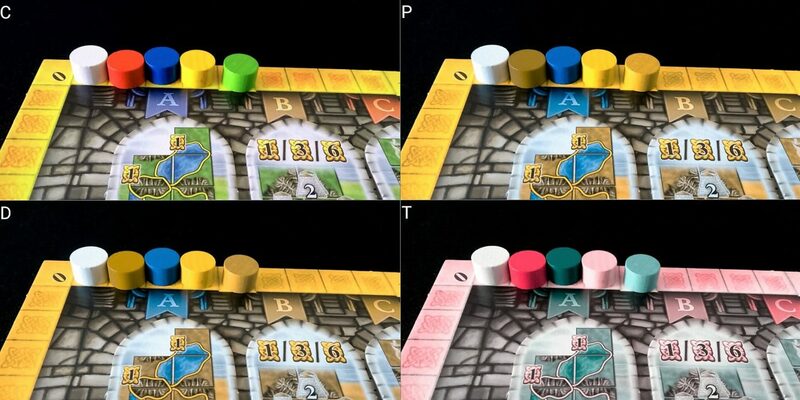 Much of the game is completely accessible to those with colour-blindness. It’s true that the island you construct won’t look quite as pastoral, but you can always pretend that you’re playing in post-Brexit Britain so that the apocalyptic colour scheme is more thematically appropriate. This is the setting of Mad Macs. The only place colour is used as the sole channel of information is in the scoring track, and the usual compensations of choosing non-clashing colours for smaller groups, or replacing a counter with a more accessible token, work as well here as they do anywhere. 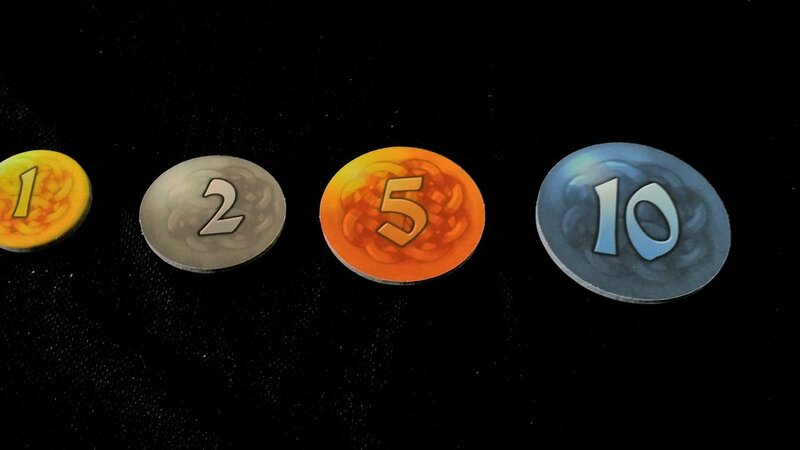 There’s even a reasonably useful workaround in the game components themselves – the black token is used for round tracking, but that can easily be swapped for one of the other counters. A clashing colour for the round tracker doesn’t matter because it’s placed in the bowls under the windows rather than on the tracking around the perimeter. As such, we’re happy to recommend Isle of Skye for those with colour blindness. There’s a lot of information to take into account during play, although the majority of it will be happening in front of you. 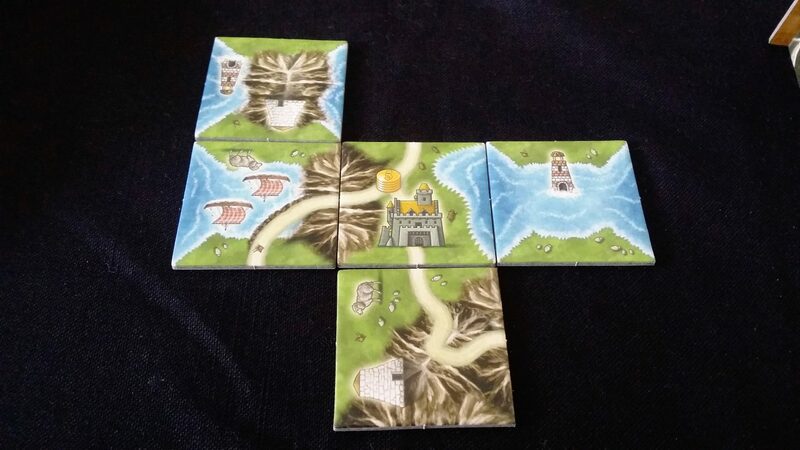 Unlike Carcassonne, you don’t need to worry about a map that sprawls out of feasible visual interrogation – there are five rounds and each round will involve the placement of at most two tiles. You’ll only ever have a maximum of eleven tiles in your island, although every other player will have the same. 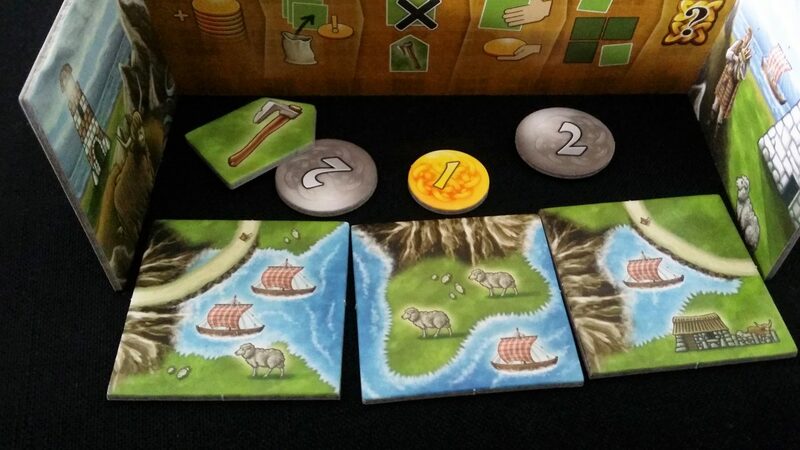 You do need to know how an opponent’s island is laid out if you want to play intelligently and buy tiles properly. Knowing what they’ll find most valuable is the key element of the tile buying phase. You can move up closer and check, but in the process you’re going to potentially leak intention. If it becomes obvious that you’re counting up the number of cows they have for example, they’ll know that it’s information that’s relevant to your own interests. This could benefit from a lookup id. To find out what a tile means, you need to find the matching tile in the reference table. Some of them though are quite similar especially if visual discrimination is low. Consider for example ‘2 VPs for each completed mountain area’, which is at the bottom of the right column. Compare that to ‘3 VPs for each completed area with at least 3 landscape tiles’, which is the second entry in the same column. Compare both of those to ‘1 VP for each completed area’, which is at the top. They’re different, yes – but not very different and this can make it tricky, at least initially, to work out what the scoring rules are. This is going to be an issue for play with agency, but presumably asking for clarification will not be a problem for most gaming groups. The selection and selling of tiles is handled via a draw from a bag – this is a nice way of ensuring that visual discrimination is not an important part of picking out the best options for sale. However the bag is so big and loose that it’s easy to catch a glimpse of what’s inside and that might disadvantage those that can neither see the contents nor identify when opponents have caught sight of tiles available. Nobody should be using this kind of information though. The coins provided are all different sizes, and noticeably so – however, they all share a circular form factor. It’s definitely possible to tell the coins apart, but tricky to correctly identify coins of adjacent denominations. You can easily tell a five from a one, but it’s not so easy to tell a one from a two or a two from a five. With practise this will become easier, but it’s almost always going to involve a certain degree of corroboration with other players to make sure you’re placing the right values if you can’t see them yourself. Adjacent coins are all noticeably different colours though, which will help in coin identification for those with some degree of visual acuity. The tiles themselves are very visually busy, consisting of animals, roads, boats, mountain and water features, lighthouses, farms, brochs and more. It’s this more than anything else that will render the game substantively inaccessible for those that cannot make out the small, relatively cluttered iconography. However, one shouldn’t simply dismiss Isle of Skye out of hand. The mechanics of the game permit for tiles to be assessed with assistive aides in relation to only a relatively small number of others in an individual island. Unlike Carcassonne, you aren’t constantly placing new tiles over a large landscape – it’s all far more localised. It does share though the same issues with regards to identifying completion and the optimal location and orientation of tiles. Geographical features must match on each edge, which can be difficult to determine if visual acuity is low. We’re prepared, just, to offer a recommendation for Isle of Skye for those with minor to moderate visual impairments. Those with more severe conditions should consider the discussion above before rushing out to buy it. The largest cognitive cost for Isle of Skye is going to come in the tile purchasing phase which is part complex economy and part bluffing game. The rules of Isle of Skye are relatively simple, although more difficult than those associated with Carcassonne. Despite this they do intersect in a way that creates considerable cognitive cost. Assessing the value of tiles is going to be difficult as it varies from turn to turn and in relation to the scrolls available on an island. Tiles that were a bad selection in one round may be very valuable in the next. This isn’t always going to be entirely in your control either. The mechanics of purchasing land mean that you often simply have to make the best of a bad situation. Even so, in the process you’ll be altering the cost/benefit calculation for yourself for all future turns. 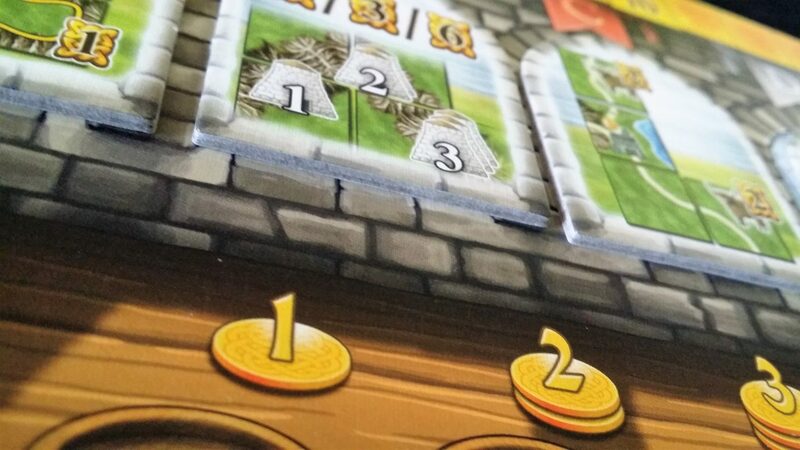 The act of assigning value to tiles and ascertaining the worth of those for sale is perhaps the single most significant part of the game and as such it’s vital that players can do that well if they are to have fun playing. It involves a degree of numeracy more advanced than the simple arithmetic would suggest – it’s a task of assessing the value of positional goods in a fixed marketplace. Of course, you can simply play without worrying about optimising the value of your transactions, but you’d lose a lot of the game’s tactical and strategic heft as a result. Scoring follows a rigid, well-defined structure but it’s not entirely obvious as to how it will work from round to round unless one is able to parse the symbols on the scoring track. Scoring is handled at the end of each round, based on the position of the round marker, and then at the end of the game based on localised scoring context. Some of these rules require reasonably cognitively expensive processing. The clumsy phrasing of the rules too doesn’t help. ‘1 VP for each sheep and each cattle that is orthogonally or diagonally adjacent to a farm in the clan territory. Also 1 victory point for each sheep and each cattle that is on a farm tile’. That can be far more transparently rendered as ‘A victory point for each sheep and each cattle on or adjacent to a farm’. 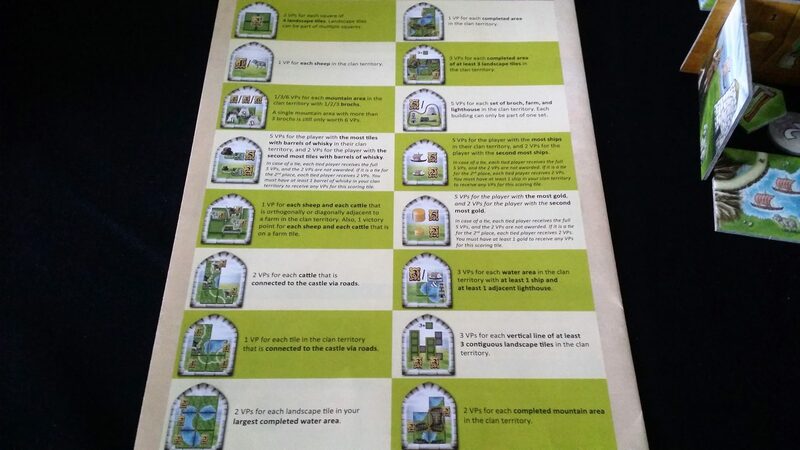 ‘2 VPs for each landscape tile in your largest completed water area’, or ‘3 VPs for each completed area of at least 3 landscape tiles in the clan territory’. These aren’t extremely difficult to understand, but they do put a strain on cognitive processing and memory that isn’t usually associated with scoring. Perhaps the best example of the kind of costs that may be associated with scoring is in the following rule – ‘1/3/6 VPs for each mountain area in the clan territory with 1/2/3 brochs. A single mountain area with more than 3 brochs is still only worth 6 VPs’. That’s a train-wreck of a scoring rule if cognitive accessibility is to be considered, and it’s only one of many. If this is an issue, it’ll be necessary for someone to handle scoring for those with impairments. In terms of memory burden, everything is placed out in the open but there is a larger context of action that must be considered. It’s cognitively expensive to recalculate economic value of resources, and so most players will do this incrementally – adjusting their own internal mental model of the economy in light of new information. That requires a fairly sophisticated understanding of how everything balances for each player. These models will obviously never be perfect, and won’t even necessarily be remotely accurate. They will though inform every purchase and price-setting decision made. Even an inaccurate mental model is cognitively expensive to construct from scratch. It needs to be held, at least substantively, in memory. This regularity contains very little conditionality, with the exception that there is no requirement for anyone to buy a tile – they have to actively choose to pass though, rather than it being a consequence of lack of choice. 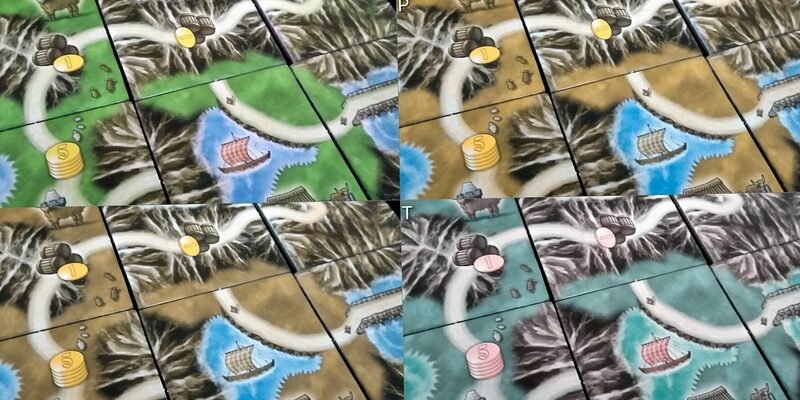 We do believe that there is a satisfying and accessible variant of the game in here, adopting a variation of the system we discussed in the Carcassonne accessibility teardown. Instead of the usual phase of drawing and selling tiles, a set number are drawn from the bag and then assigned a set value. Players take turns to buy a tile, and the rest are put back in the bag. The game is then collaboratively played with the intention of maximising a shared score. This would maintain much of the Zen-like relaxation that goes along with building up an island while eliminating the cognitive costs of the competitive economy. For an even more cognitively accessible variant, the scoring can be simplified by having each player working to a single criteria, or using only a subset of the simpler scoring conditions. When we talk about cognitive accessibility, we tend to be willing to discuss variants of play that aren’t supported by the rules – our key criteria here is ‘would the game be worth playing?’. The cognitively accessible version of Isle of Skye would certainly not be as interesting, but it would still be a worthwhile experience that could be played, with support, by those with a wide variety of cognitive impairments. As such, we tentatively recommend the game for both categories of cognitive impairment, with the proviso that the inaccessibilities discussed above are house-ruled away. The game gets a reasonably clean bill of health here. The style of competition in the game is aggressively indirect, with no ability for one player to actively undermine another. Even the buying mechanic requires players to opt-in to punitive costs for desirable tiles, and they can choose to pass if the cost is too much to bear. They do this in the full knowledge that the player proposing the sale will bear the cost. The only real area of some slight concern is that the design of the game, and its scoring system, is one that is fertile soil for breeding points disparity. As part of the offer of tiles, you are left with what your opponent doesn’t want, and as such while you can influence the outcome you can’t guarantee scoring. An opponent that is doing well with the generation of income can price you out of any useful tile. They can do this knowing that in order for you to generate scoring opportunities it will become necessary to impoverish yourself. However, the game also comes with a catch-up mechanic – the players behind the leader each get free money at the beginning of their turn. This doesn’t eliminate the problem, because money is converted into victory points at a punitive rate. It does though correct a financial imbalance somewhat. Really though this is a minor worry, and we have no problems in strongly recommending Isle of Skye in this category. The shockwave that goes along with nudging tiles will only propagate through a handful of tiles. While there is adjacency of placement to consider, over the game you’ll only be working with eleven tiles in total which greatly reduces how often this will happen. Locating the game in front of the player eliminates map sprawl. Given the smaller scale of your realm, you can even avoid the need for strict adjacency of tiles – you can keep them padded from each other and still be able to meaningfully parse the game state. However, Isle of Skye does introduce an inaccessibility in that every round it’s necessary to draw tiles from the bag. This is a physical process of reaching in, picking out three tiles at random, and then withdrawing them. It’s not onerous, but may be an issue for those with no degree of physical agency. Strictly speaking this is something that can be done on your behalf, because once the tiles are drawn it doesn’t matter if everyone sees them. However, the bag is loose and it’s easy to accidentally catch a peek at what’s inside – the nature of the bag shaking to shuffle means that you’ll occasionally clearly see some tiles even if you don’t mean to. As a result, you’d need to be willing to trust that your opponent will be making a genuine random draw and not taking advantage of leaked information to disadvantage you. Having said that, the amount of cognitive processing required to cheat in this manner in a way that isn’t obvious would be considerable, so it’s probably not something to really worry about. If it’s not possible to place your own tiles, as may be the case with severe physical impairments, the greatly reduced scale of territory makes verbalisation much more feasible than it might be in Carcassonne. While the tiles have no identifiers, you’ll be creating your own interpretation of your island as you build it, and can say ‘Left of the northern mountain’ or ‘south of the small lake’ and so on. There won’t be so many of these features that you’ll often find it necessary to puzzle over an unambiguous reference. One issue though is that before the revelation of tiles, it’s necessary for each player to make some arrangements behind their screen and those arrangements are to choose prices for two tiles and select which is to be discarded. This should be okay for most players provided some degree of physical movement is possible – precision is not required and the value of a tile can be physically positioned independently of the tile itself. For those for whom verbalisation must be considered, this is somewhat trickier but not impossible – the screen serves only as a way to allow simultaneous choosing and revelation of choices. Playing without the screen would eliminate that, but I don’t think it would have a massively deleterious effect on the game experience. Players would need to decide quickly on the basis of complex calculations if they wanted to covertly switch their choices – it would be possible but I doubt many people would be able to do it sufficiently seamlessly to take the risk. If the screen was to be retained, it’s relatively easy to enforce a rule that no changes can be made by the supporting player after they have actioned the decisions of another. This can either be on the honour system or a more rigorous requirement for ‘hands on the table where we can see them’. We’re willing to recommend Isle of Skye in this category. I know I complained about it in the review, but the lazy stereotyping of Scotland is fine. I’m Scottish, and I think I’m legally empowered to speak on behalf of all my people. It’s okay. Gender portrayal is something of an issue, since the box art adopts a portrayal of rugged masculinity that may be offputting, although you know – it is a man in a skirt so maybe not. The manual though does explicitly gender the end goal: ‘Five clans are fighting for dominance over the island. Only the chieftain that best develops their clan territory and trades more cleverly will become king of the Isle of Skye’. The clan screens only change colour, rather than character, of the chieftain being shown, and it’s a missed opportunity not to include at least some diversity to the game. Yes, I know – ‘historical realism’ and all, but that doesn’t cut it here. This is a pasted on theme, and Skye never had a king. Also, the leader of a Scottish clan would have been a chief, not a chieftain. A chieftain is kind of underling mini-chief. Historical accuracy is only a reasonable defence if a game is historically accurate. The game isn’t particularly cheap at £27.50 but you are getting a lot of variety in the box. It’s not like playing a different game each time, but it’s definitely like playing a different variant every session. It scales well, from two to five players, and it’s fun at all levels. You’ll find plenty of opportunities to play it, with a slim sixty minute play-time, and I suspect it’s a game to which you will keep coming back. I don’t think this is a timeless classic, and I think in three or four years people will mostly forget it existed. However, you’ll regularly see it on your shelf and think ‘That’s fun, let’s give it a go’. We recommend Isle of Skye in this category. The game has no required reading level and can be played in stony silence. As such we strongly recommend it in this category. Those with visual and physical impairments may find checking up on their opponents is a little tricky because it will likely involve a degree of getting up and examining their constructions close up. It’s not as if they can just pass them over for you to have a look at – you’ll need to see them in place. It’s important to know what each island looks like when it comes to setting price and buying tiles. It’s more involved than simply asking ‘How many coos do ye hae?’ because positionality of the tiles matters. That’s likely to be an issue. For those with physical and communicative impairments, the need to indicate the placement and positioning of tiles is likely to cause problems. While there isn’t necessarily a lot of this, you will need to indicate pricing of tiles, location of tiles, and intention to buy. This is probably not an insurmountable problem, but one that bears consideration. Isle of Skye is a reasonably brisk game, coming in at around sixty minutes of play with a full group, and perhaps half an hour with two or three. As such, it isn’t likely to be long enough to exacerbate issues of situational discomfort or distress. However, it’s simple for players to drop in and out provided the minimum player count is met. The tile buying and selling phase permits each player to purchase only one tile, so it doesn’t scale with player count. As such, a missing player simply means fewer options, not an unplayable game. It’s important that a high profile game adhere to the highest standards of accessibility if we are to make this hobby more inclusive. Isle of Skye doesn’t quite live up to what we’d hope for, but it is broadly playable across the board. In order to be accessible, certain concessions may have to be made and certain support provided by the group. However, if you want to play the game you’re probably going to be able to. We like Isle of Skye a lot. It’s fun, and stuffed with interesting decision making. It’s a worthy winner of the Kennerspiel des Jahres. While we suspect it’s not going to have the same cultural stickiness as Catan, Carcassonne, Ticket to Ride or Dixit we suspect it’s a purchase you’re never going to have cause to regret. Och aye the noo.